June | 2013 | Old Bat On A Bike. Today we took the cable car from Chamonix to the Aiguille du Midi. The Aiguille du Midi is developed into a series of viewing platforms which carefully keep people not equipped to go out on the glacier from doing so. The French do a good job in keeping everyone safe. From there we took the gondola over the Glacier Geant to Point Helbroner. We were up around 3600m for the several hours but the haute montagne environment and the spectacular scenery and views were well worth not being able to breathe. This entry was posted in Walking on June 28, 2013 by Ian. 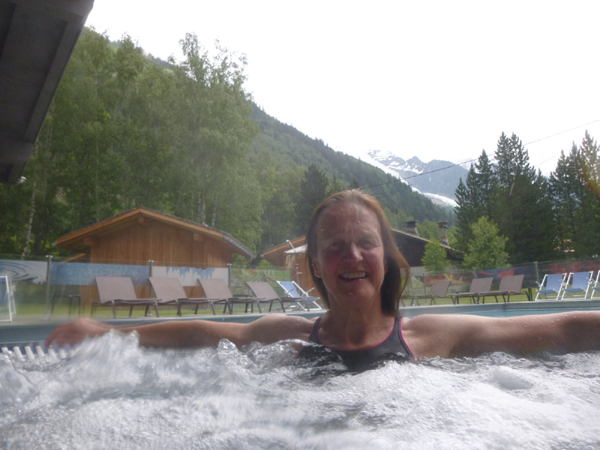 After the arduousness of the Middle Distance Triathlon I am now in Chamonix having a relaxing holiday. We are here to walk round the Tour du Mont Blanc but this is not possible because there is still too much snow above 2000m so instead we are just staying at a much better Hotel then we are used to and doing some walking. Our first day had low level cloud so we headed up to Col le Brevant to see if there really was too much snow. There was. No way of walking up there without full winter kit and we were not up for that – besides which the cloud is low and we couldn’t see much so what was the point. So back down to Planpraz at 2000m and although there was some snow to start with it was a pleasant walk along to Flegere. There were plenty of Alpine flowers on show so although the views were largely obscured by cloud it was still a pretty walk. There was red tape all along the footpath as it is part of the route for the Mont Blanc Marathon which takes place at the weekend. There were several runners out having a look at the route and, I guess, getting used to the altitude. The weather deteriorated so we decided to take the train up to Montenvers Glacier. The glacier is 7km long and 600 feet deep. It is the longest glacier in France. The view of the glacier was really spectacular – just as you imagine a glacier to be. The railway was completed in 1913 and the station was built at the level of the glacier. Today the level of the glacier is so low that there is a gondola ride down and then 430 steps – down and back up. This takes you to the ‘Grotte de Glace’ which is excavated out of the glacier which is moving at about 1cm an hour. The caves are re-sculpted every year and touched up every morning. Inside the caves there are ice sculptures of various rooms in a house. You can even have your photo taken with a St. Bernard dog for 6 euro! 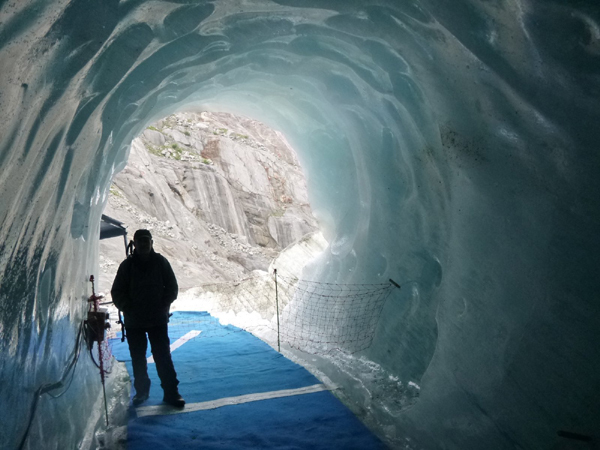 We were blown away by the experience of being inside the glacier. After all that excitement it was back to the Hotel for some relaxation in the Jacuzzi. This entry was posted in Walking on June 27, 2013 by Ian. To complete a Middle Distance Triathlon probably wouldn’t be top of most people ‘things to do before you die’ list but I have had this event in my peripheral vision for about 9 months and plucked up courage to enter it a couple of weeks ago. In the week preceding the race my new bike tyre got a puncture on its first outing. The pre event check at Mud Sweat and Gears revealed a very worn bottom bracket which was replaced – and new brakes too. Due to ageing joints I don’t do very much running these days so seriously undertrained for a tough half marathon after cycling 60 miles. There were no other women over 50 in the event. Pre event I was not calling this a race as I had no intention of racing. My intention was to just get round, in one piece, and hope not to come last. We had to register at Sandy Balls the day before the race on Saturday 22nd June. Having parted with the £110 entry fee a couple of weeks early I was quite pleased to find the T shirts were not a condition of finishing. (Thoughts of going home now?). ‘I only came for the t-shirt’! The bag containing my running stuff was left at Sandy Balls as this was where I would finish the bike ride and Transition 2 – bike to run was at Sandy Balls. We camped overnight nearby and were up at 04:30 shoveling down vats of porridge as pre race fuel. The weather forecast was unfortunately correct. Cold and overcast with a strong north westerly wind. The race started with the swim in Ellingham Waterski Lake. There was quite a lot of faff to do with racking the bike and setting up the stuff to wear on the bike in Transition 1 (swim to bike) before it was time to wriggle into the wetsuit, (with running kit at the ready underneath) and put on the orange hat. I was feeling quite nervous at this point – fear of the unknown. However, time accelerated and before I knew it I was in that lake treading water waiting for the start and then we were off. Apart from it being the wrong colour and not being salty it was similar to swimming in a very calm current free sea. Quite nice. I was round that swim and out of the water into transition in 25 minutes. For the 60 mile bike ride I went for comfort rather than speed and put on a long sleeved cycling top, cycling shorts, socks and gloves. I jogged out of transition in my cleated cycling shoes and out to the road to the mount line. I now have a number on my back and I become a different person. Competitive or what? I rode as hard as I could, harder than I should have done bearing in mind the half marathon to follow, but I was having such a lot of fun overtaking riders who had swum quicker than me that I really found it impossible to be more sensible. The wind was very strong and inevitably it very rarely felt like a tail wind. Drafting is strictly not allowed in triathlon so there was no help from anyone else. The ride was quite a picturesque tour of the New Forest and there were plenty of ponies and foals around to distract. I arrived at Sandy Balls after about three and half hours on the bike – meaning an average speed of over 17mph which for me, on a hilly course with a strong wind blowing, is very fast. Clip, clop along to Transition 2, rack the bike and then get the cycling kit off. I had swum in the running kit so it was all there ready and it was just a matter of putting my running shoes on – and running. These were legs that were not that keen on running. when that imprudently fast bike ride caught up with my legs and I slowed to a jog. Sadly two women overtook me in the last couple of miles but there was nothing I could do about it. I had given my all. It was a very tired bat that eventually arrived at the finish at Sandy Balls just over 6 hours after starting the swim in Ellingham Lake. I quite enjoyed the day and was pleased not to suffer any problems with equipment. It is an experience I am delighted to have had, but one which I do not intend to repeat. This entry was posted in Cycling, Running, Swimming on June 23, 2013 by Ian.